The husband needed a Halloween 2009 costume appropriate for faire, and boy, did I deliver! I’m so lucky to have a husband who will dress up for almost any occasion with me. This go ’round was Superman, circa 1560-80ish. The ensemble debuted with a standard doublet, [what were supposed to be] short slops, and a full-circular cloak. We ordered new tights to match, and I made the chain of office out of a belt buckle and ribbon. With more time, he would have had appropriate footwear and a soft cap. The doublet and slops fabric came from the home decor section; both are lined with cotton broadcloth. 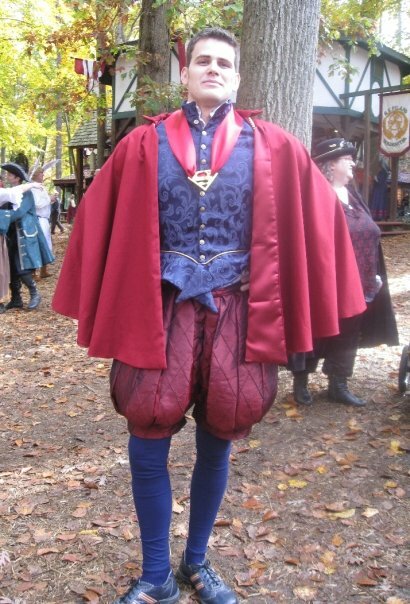 The cloak is made of twill and lined with a heavy satin. He wore his usual white shirt, which is being retired from his nobles wear until I can get the developing arm and neck stains out. Post-debut, I need to remember to shorten his slops in the legs and/or tighten the leg bands so that they fall shorter. I always lengthen the crotch because of his height, but I never account for where the slops are supposed to stop when I do the adjustments. I’m also perplexed on how he should wear the cloak; it had to be adjusted throughout the day. I’ll add hooks [and loops] before he wears it again, but I can’t tell if it’s slipping from the weight of the cloak, or from the weight of the cording, which is quite heavy. Brilliant! I love that and so would my husband!